When I decided to invest in a new CB radio 2 years ago, my obvious choice was one of the new Cobra CB radios models. Two of my favorite pastimes is off-roading and cross country driving. You can call me old school but I prefer a CB radio setup on my truck over GPS. I really don’t trust the reliability of GPS after getting lost a couple of times while off-roading. Cb radio, on the other hand, enables me to keep in touch with real drivers and get additional info my truck GPS cannot provide. Back to my 2-year-old CB. I decided to go with the Cobra 29 lx 40 channel CB radio since it was relatively new and other drivers really loved it. After using it on over 20 occasions in different locations, tracks and environments, I decided to create this Cobra 29 LX CB Radio review. handy while you’re on the road and need up to date information regarding prevailing weather, accidents on your route among others. One of the unique features that make this CB radio stand out is its large colored LCD display. It comes in four color choices and I prefer green. The display lighting can be adjusted making it easier to read in different light conditions. The display shows readings of time, current channel, S/RF, and SWR among others. I usually love to monitor channels with the most activity. The Cobra CB radio offers automatic scanning for all 40 channels briefly stopping at channels with activity. If you find channels you like monitoring, this unit’s memory is capable of storing up to 10. This makes it easy to access them more quickly without running a full scan. One feature that makes the Cobra 40 channel 29 lx CB radio stand out is it’s Radio Check Diagnostic system. You can now easily test crucial functions such as battery voltage, RF power and antenna condition directly from the CB. This feature makes it easy to troubleshoot and fix any problems before finally hitting the road. Although I rarely use it, the PA feature is a good addition to this CB radio. The Cobra 40 channel CB also produces clear voice output thanks to special features like Dynamike, Delta Tune, talk back control and RF gain control. The built-in clock/alarm is also a feature I particularly like. It seems that this unit’s memory doesn’t store the last clock settings. I usually have to adjust the clock every time I turn on my truck. However, this doesn’t affect the units overall performance. 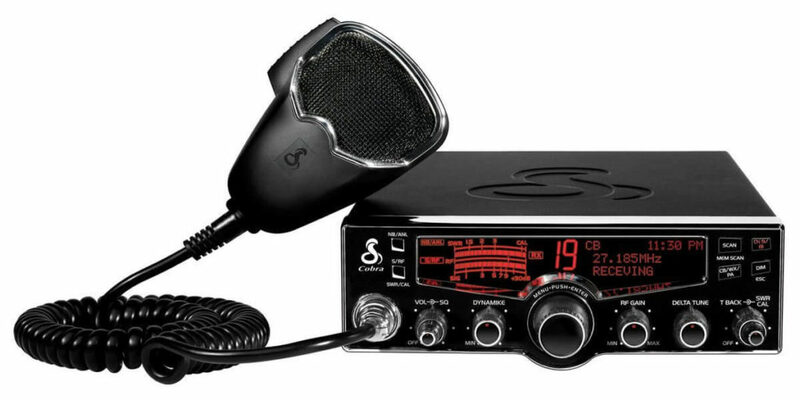 If you’re looking for a quality CB radio for your truck or vehicle, the Cobra 29 lx makes a good choice. The unit includes many features that you’ll find in many modern CB radios. It goes a little further to provide unique features such as self-diagnosis, use as a PA system, easy adjustment for clear voice output and a large multicolor display among others. Cobra 29 LX CB Radio is the best CB I had in 24 years. I always used cobra CB’s the 29 LX Radio has more features and built-in SWR to set in the antenna the weather station changed the screen color much more you will love it . Good features, great reach Really well channel scan option is great. It works great with my astatic 636. overall I’m very pleased with it. The only problem with it Slowly drains battery when all features are off.